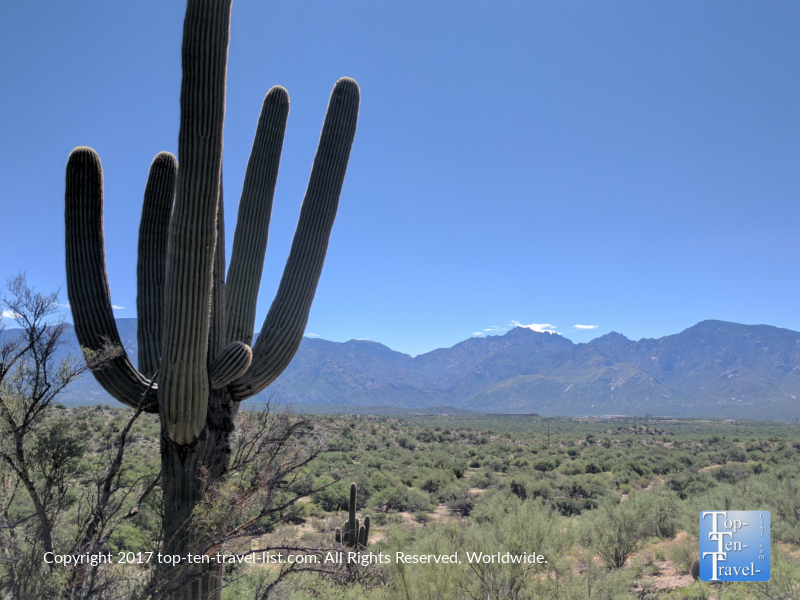 5 Easy & Scenic Tucson Hikes for the Hot Summer Season - Top Ten Travel Blog | Our experiences traveling throughout the US. Finding things to do during the summer months in Tucson can be a real challenge. The city does not offer much in the way of world class indoor attractions, however, it is surrounded by 4 beautiful mountain ranges, and thus, offers plenty in the way of outdoor recreation. Unfortunately, temps hover in the 90-100+ degree range for more than half of the year. During the summer season, temps can easily reach 90+ degrees by 9am. Add in intense sunshine and little shade, and doing anything outside becomes even less desirable. A typical summer in Tucson consists of hiding in the air conditioning day after day. Fortunately, for the nature & fitness buffs, there are still a handful of doable shorter hikes which, assuming you plan your hike at sunrise. Morning temps usually range in the more tolerable 60-80 degrees, however, you have to get out there ASAP as the temps rise rapidly this time of year. Nighttime is a different story, with temps still hovering in the high 90’s at sunset, thus, hiking at this time is not recommended. I recommend getting on the trail no later than 7am and keeping you trek under 2 miles, especially during the months of May-September. The Linda Vista trail is the best hike in the Tucson metro area for those looking to keep it short without sacrificing the views. 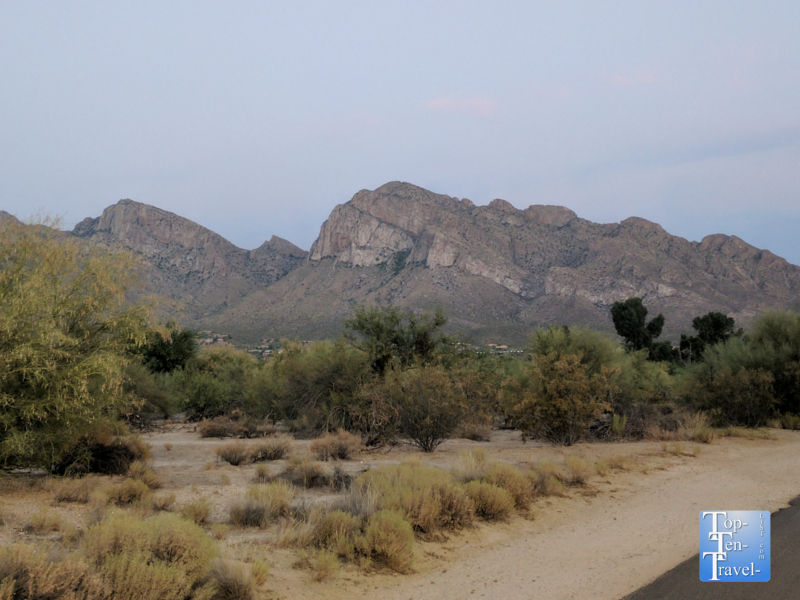 This extremely picturesque hike is located in Oro Valley, a suburb just 30 miles north of Tucson which sits at the base of the magnificent Santa Catalina Mountains range. At just over a half mile long, the easy Linda Vista loop hike is the perfect choice for a quick, scenic morning workout. Tremendous views of the mountains, diverse plant life, and the high likelihood of seeing a bobcat, keep things interesting despite the short distance. This hike is one of the few which you can still enjoy at sunset because of the limited time you will be out in the heat – a half hour at most. The sunsets are pretty spectacular in Tucson with the silhouette of the cactus and the beautiful array of colors as the sun sets over the mountains. Bobcat sightings are a common occurrence! 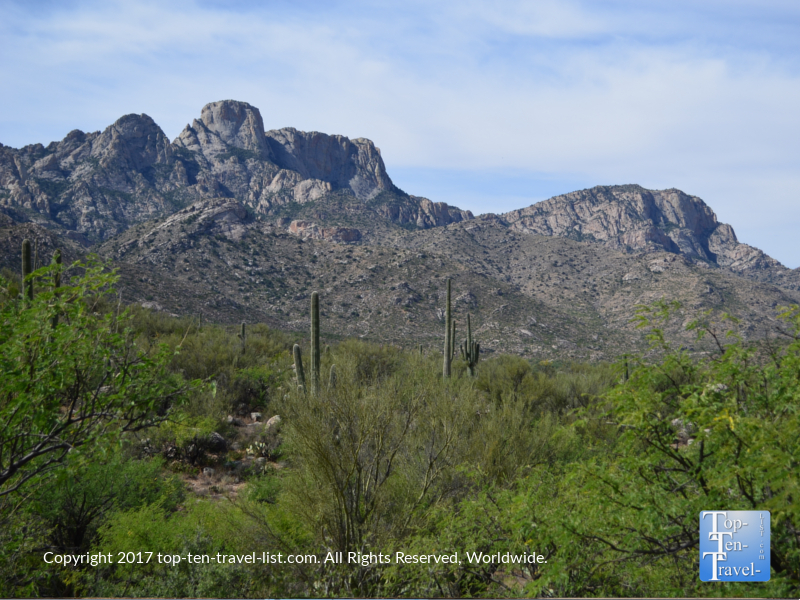 Honeybee Canyon is another scenic, relatively short trail in the Oro Valley region, featuring more beautiful panoramic views of the majestic Catalina mountains. While this trail is a slightly longer and steeper at certain points, it’s still a great summer choice if you hit the trail near sunrise. The trek is just 1.5 miles and features the most scenic overlook of the Catalinas anywhere in town. You will find one steep section going up to the overlook, but the pay off is well worth it for the tremendous scenery! Interesting plant life lines the trail and you will definitely have more than enough opportunities to take your picture next to a towering Saguaro cactus. Don’t get too close though or you will be picking dozens of tiny needles out of your skin! Wildlife is abundant due to the serene setting and birdwatching is a popular pastime amongst locals. Despite being just minutes away from numerous HOA communities, this trail remains pretty isolated throughout the year. In fact, it’s a rare sight to see anyone else on the trail. Enjoying the majestic desert landscapes all to yourself sure is an awe-inspiring experience. Great photo opps await you at every turn, so don’t forget your camera! You will also get in a fabulous little workout, without the need to subject yourself to the heat for too long. 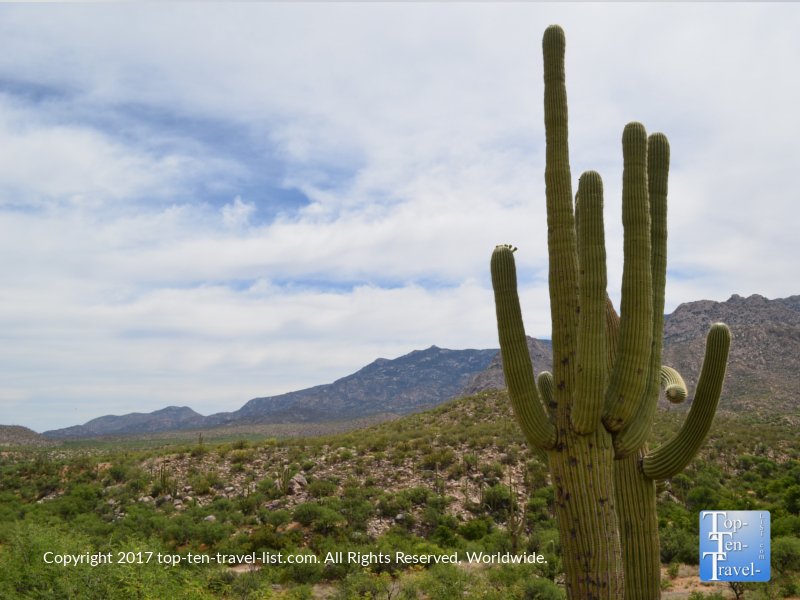 Saguaro National Park is one of the country’s most interesting national treasures. This park is split into 2 sections: The Tucson Mountain (West district) and the Rincon Mountain (East District). Both sections offer their own advantages, with the Tucson District being more secluded and rustic, and the Rincon district featuring more spectacular mountain views as well as a scenic paved drive. If you have time, I recommend visiting both as your pass is good for 7 days and includes entry to both. 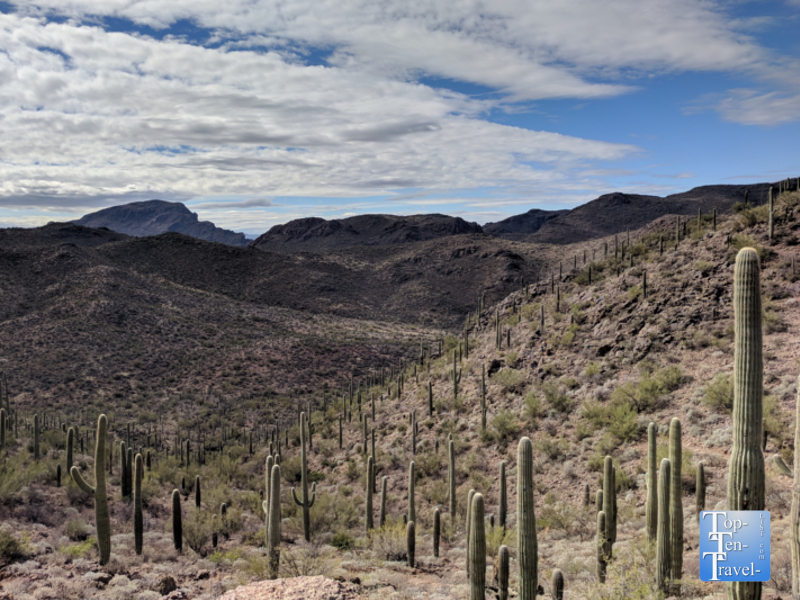 The Valley View trail is a short 0.8 mile loop which takes you past a diversity of desert plant life before eventually leading you to a scenic overlook of the area. This trail is easy enough for hikers of all abilities, just be sure to get out here early. 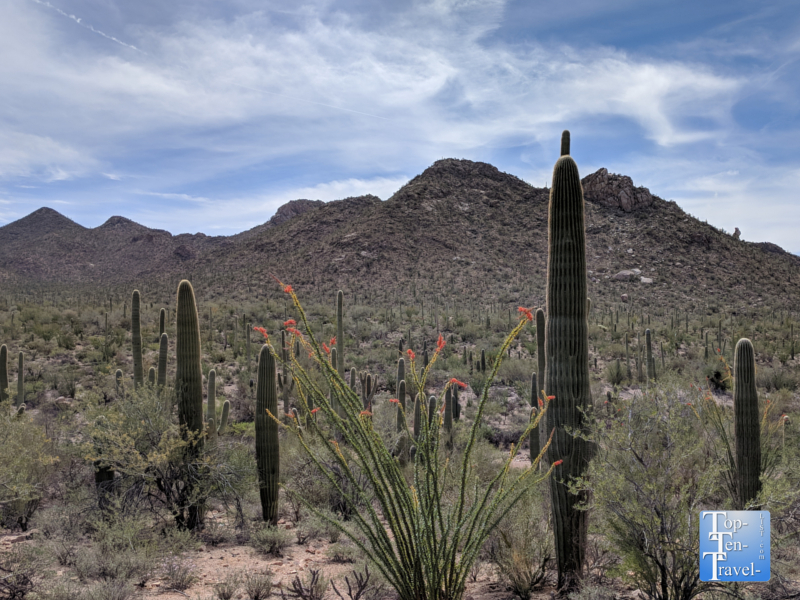 To get to the trail, you will get to drive the scenic & rustic (although quite bumpy and unpaved) Bajada Loop Drive, which is lined with thousands of interesting cacti. The drive is so natural & barren, giving you the feeling of driving through the Sonoran before it became overpopulated. And the drive to Saguaro National Park itself is equally stunning. 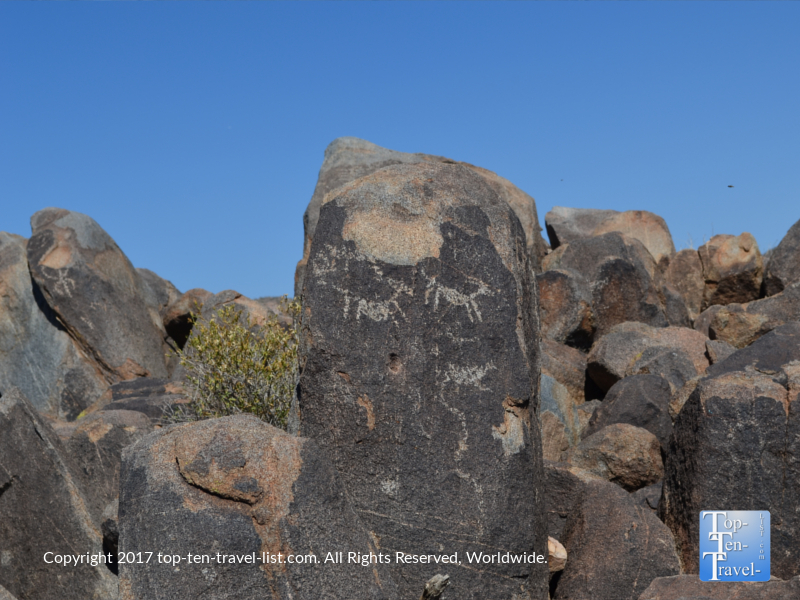 Other interesting summer trails at SNP: Signal Hill (a 1/2 mile hike to ancient pictographs), Desert Discovery trail (a 1/2 mile paved trail with interpretative signs highlighting the diversity of desert plant life). Catalina State Park is another gem in the Oro Valley area. Despite being located on a very busy road, the park remains peaceful year-round. More than 5000 Saguaros are located within the park. The cheap entrance fee (just 7 bucks) makes this park a nice budget friendly alternative to Saguaro ($20 per car). Catalina is a perfect summer hiking choice as most of the trails here are pretty short. Easy summer options include a mile long birding and nature loop and a 0.75 mile interpretative trail. The 2.3 mile long Canyon Loop Trail is the best bang-for-your-buck summer option as it’s short & scenic & relatively easy for most hikers. This hike should take no longer than a hour or so, and thus, is a perfect quick option on summer mornings. 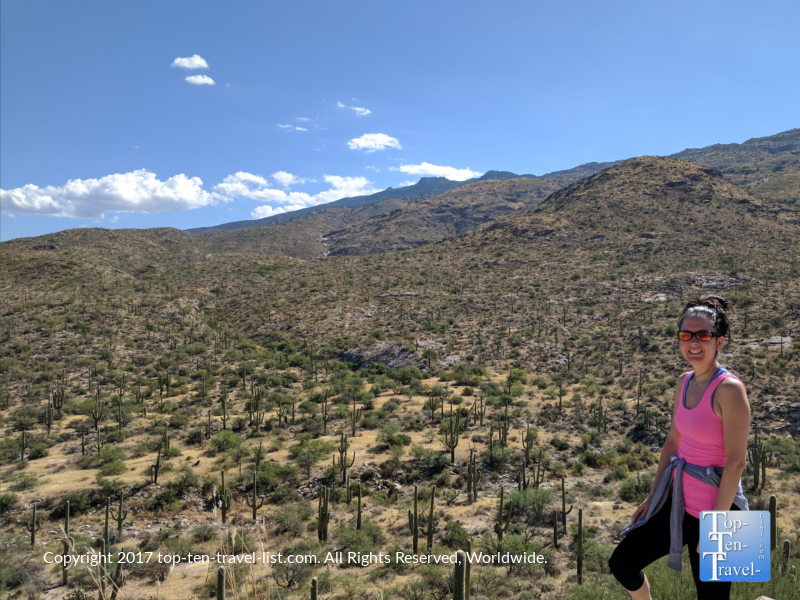 Hiking at Catalina is so relaxing with grand mountain vistas providing the backdrop to every trail, and tons of varieties of cacti including the Saguaro, Cholla, and prickly pear to explore. There are never more than a handful of hikers out, so it’s easy to take uninterrupted photos. You’ll see lots of lizards crossing the paths here as well as many interesting birds (the park is home to more than 150 species). The Hidden Canyon Bowel trail is a relatively easy 1.8 mile loop hike which begins at the luxurious JW Marriott at Starr Pass Resort. Not only is this hike incredibly scenic, it’s also completely free, yet just as scenic as the big parks in town. If you are looking for solitude, you are in luck as this trail is deserted most of the time due to the hidden location. While tourists hang around the resort’s pools, you can enjoy the incredible desert scenery all to yourself! 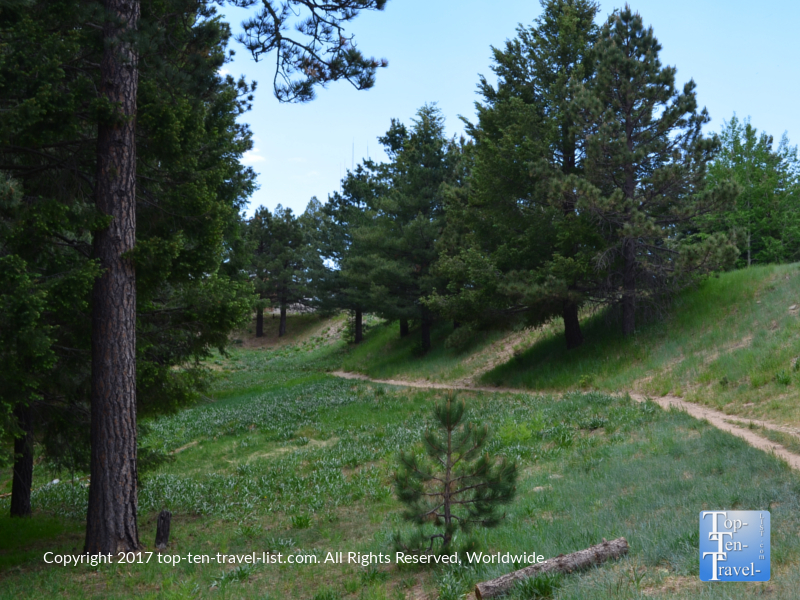 Regardless of whether you are staying at the resort, you should plan some time to hike this amazing trail. This trail lies within the beautiful Tucson mountain range and the views are tremendous for the entire trek. 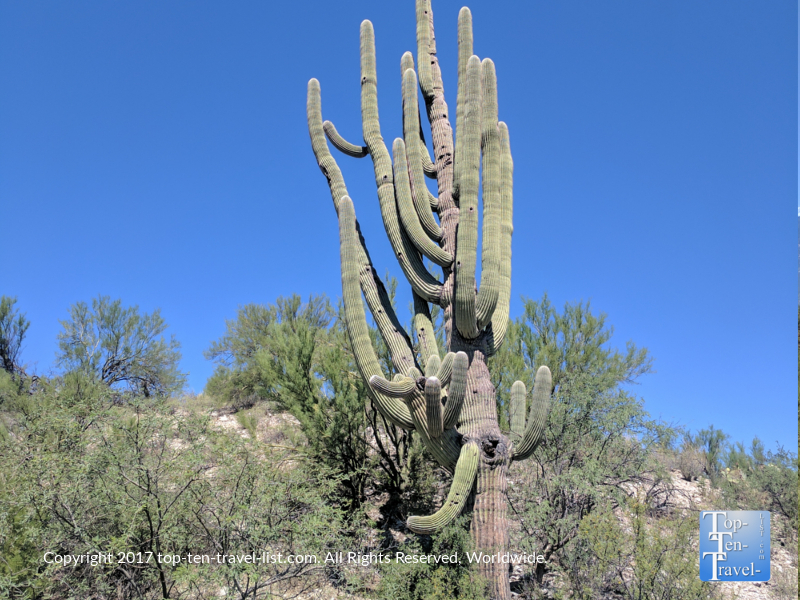 Like all other Tucson trails, you will travel through the most amazing desert landscapes, coming across many different species of cactus including the Saguaro only found in the Sonoran desert. 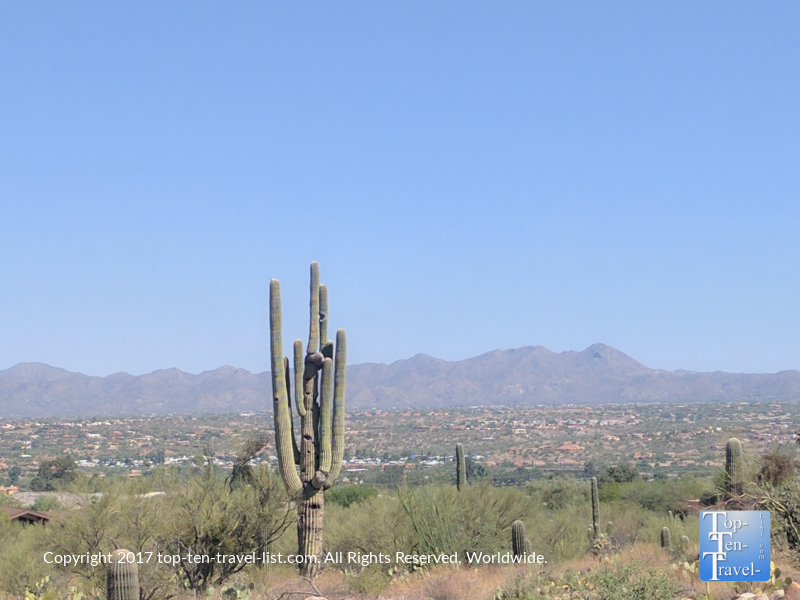 Unfortunately, businesses continue to replace the natural landscapes around Tucson, so hiking is your only option for seeing lots of cacti. 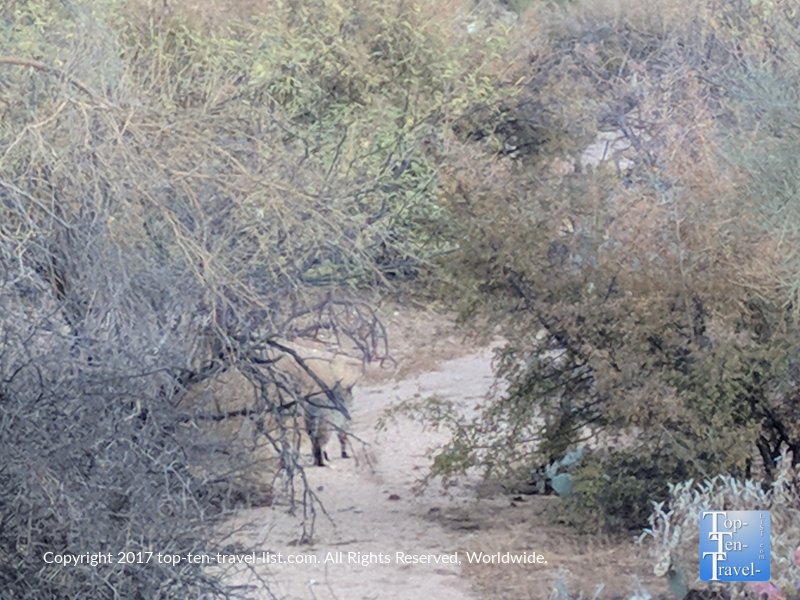 Bobcats frequent the area especially during the early morning hours, so keep your eyes peeled. The trail is well-marked, however, there’s lots of loose rock so you have to constantly look down! Fortunately, the overlook vista features the most enchanting views of the canyon. 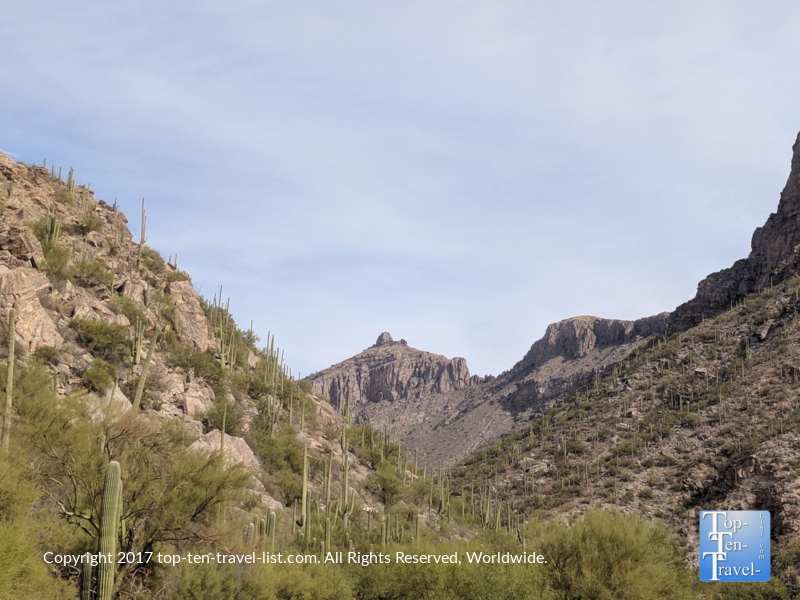 Other decent summer hikes include the nature trails at Sabino Canyon, although the entrance fee is steep here for what you get and it’s always over crowded and difficult to find parking. What Sabino does have is an awesome tram ride which will take you past the incredible canyon scenery without the need to break a sweat in the heat. Sweetwater Preserve is a newer trail system which features 11 miles of interconnected trails, so you can basically customize your own hike to your preferred distance. 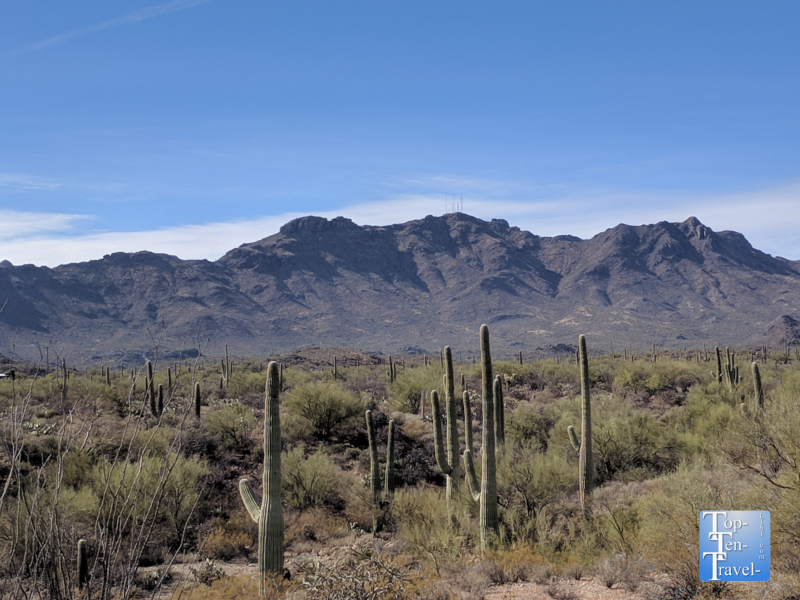 While Sweetwater Preserve is not the most scenic hiking area in Tucson, it is free to park, close to town, and there are more than enough trails to customize your own trek. And of course, the best option of all during the summer is to take a drive up to Mt. Lemmon where the temps are typically 20 degrees cooler. Just an hour away from the heat of the Sonoran, you will find numerous pine and aspen lined hikes, along with a scenic chairlift ride and a few restaurants nestled in the trees. The drive up the Catalina Scenic Byway is a long, slow 30 miles, but worth it for the interesting scenery changes and drastic drop in temperature. Cool pine tree lined trails await you just an hour away at Mt. Lemmon, which sits at an altitude of over 7000 ft. If you are not a hiker, consider a bike ride or walk along the Rillito River Path. This is a wonderful city wide system of almost 100 miles of paved multi-use recreational trails. The path is flat, scenic, and is mostly interrupted with only a few road crossings. A good starting location is at Rillito River Park, which is also home to a great year-round farmer’s market. 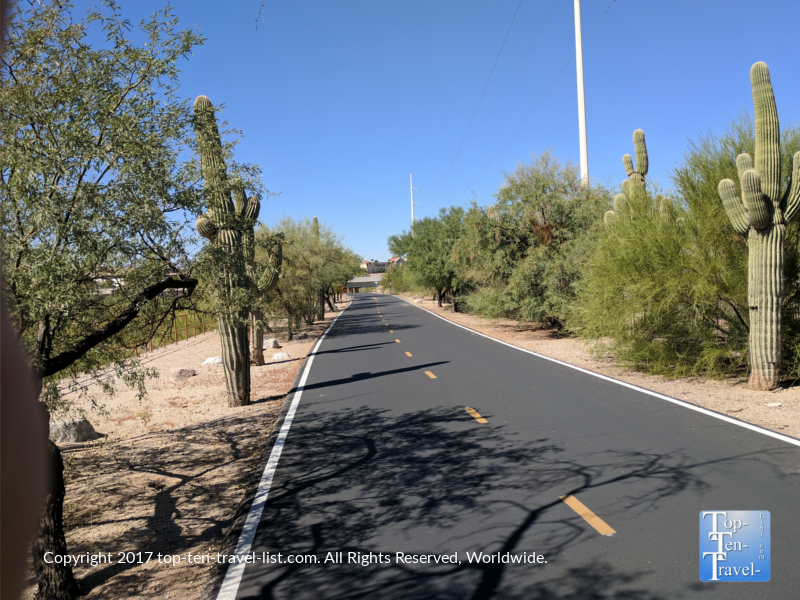 The Canada del Oro Riverfront Path, a 7 mile paved multi use path in Oro Valley, is even more scenic with the towering Catalina mountain comprising the backdrop. Grand mountain vistas line almost the entirety of the scenic Canada del Oro Riverfront Path in Oro Valley. This mostly flat, paved route stretches on for about 7 miles, so you can make it a long ride or a short one depending on the heat! *Bring with plenty of water and snacks containing electrolytes. *Always wear sunglasses due to the strong glare. *Remember that the summer season is also monsoon season. Check the forecast and be prepared for a random storm even if it looks sunny when you first set out. *Do not approach any wildlife. Javelinas and bobacts have been known to attack, both humans and especially pets! Leave all snakes alone – most attacks occur when people mess around with them! *A good hiking stick and hiking shoes are always a must. *A GPS watch helps to more accurately judge the distance as in the desert distance can be deceiving.